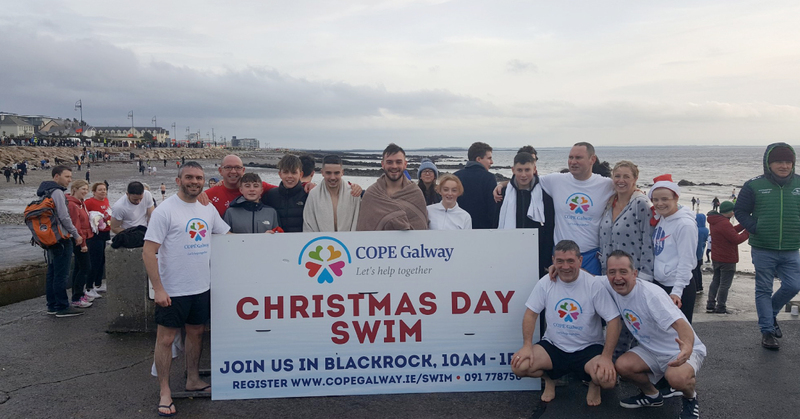 Record numbers have come down to this year’s 29th Christmas Day Swim at Blackrock, Salthill, in aid of COPE Galway’s Services for people experiencing Homelessness, Domestic Abuse and services for Older People in Galway. With over 900 swimmers taking part, an estimated 8,000 people thronged the steps of Blackrock in a steady stream throughout the morning in what has become an annual family tradition for those living in and returning to Galway for Christmas. One man, Peter Read from Australia, said “I’ve come back here, 18 years later, to bring my family over from Sydney to take the plunge just like I did many years ago – it’s an amazing tradition and Galway is such a fantastic place that’s proud of its community!”. “The crowds this year are unbelievable”, said Jacquie Horan, COPE Galway CEO. “We are blown away by the support from all the Swimmers and Volunteers and, in particular, all of the Services that have shown up today, from the Galway Lifeboat Service, to the Civil Defence, the Lifeguards, the Gardaí and more – all have helped make this a safe and enjoyable event today”. As 2018 draws to a close, COPE Galway is working with and supporting over 830 households across all three service areas, reaching out on behalf of the Galway community and offering a better quality of life for people who seek support. Funds from the swim will go directly towards keeping these vital services operating. If you wish to contribute, please text “COPE” to 50300 to donate €4 to COPE Galway, or visit www.copegalway.ie to make a donation. 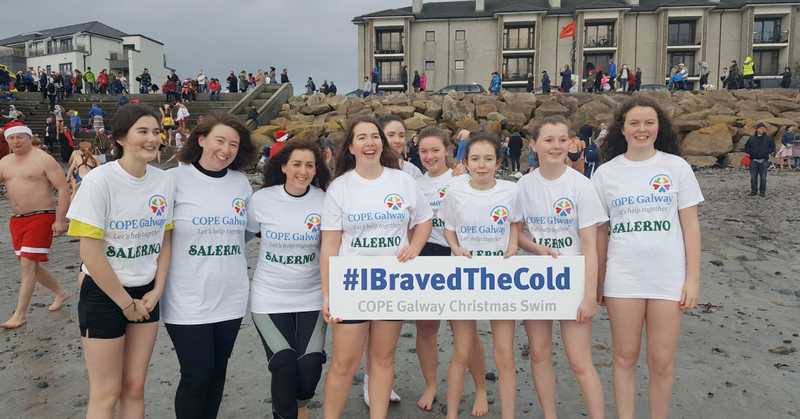 For pictures of the COPE Galway Christmas Day Swim event, please visit the COPE Galway Facebook, Instagram and Twitter pages for updates over the coming days.